Have you ever used a product and thought “if only it had this feature…” or “if I could just do that easier” wishing you could spend a few minutes with the developers to hear you out? Well, today we’re excited to introduce a new section of the Norton Community called Norton Ideas which will allow you to do just that. Norton Ideas is a site that will allow you to submit your product feature suggestions directly to the Norton product development team. The Norton product team is here to listen to your suggestions, discuss them amongst the community and put the best ideas into motion. - Step 2: Norton Community members comment on new ideas and give kudos (votes) to the ones they like. - Step 3: The Norton product team reviews the ideas, engages in the community discussions as needed and assigns each idea a “status” indicating where it’s at in the cycle. It’s possible your idea could be put implemented into an upcoming Norton product release! Our sincere hope is that Norton Ideas will provide a new destination for our customers to provide the input that will help us continue to deliver the best products on the market. In the beta phase of the Norton Ideas site, we welcome ideas for Norton AntiVirus, Norton Internet Security and Norton 360. So don’t be shy, tell us what you think! We’re looking forward to hearing your fresh perspectives! I'm sorry you had that experience with Customer Support. If you would post over in the Norton Forums for NIS or NAV if that is what you have, or Norton 360 it it is that one, I'm sure we can help you sort this out including using the OnLine Chat which most people have found to be quicker and extremely helpful. Give more details please including whether you bought it on line from Norton or from an online Store, or from a retail store; if you are not in the USA/Canada then what country you are in; whether you did install on any computer and whether you activated any of them before you mislaid the key. There is also on line a procedure for getting a refund if you bought it within the last 60 days but you may have a problem if you do not have the envelope which is required since that has the KEY on it. There may well be a problem if you cannot produce enough information but experience shows that they lean over backwards to try and help -- accidents do happen. The Norton Ideas URL gives an 'invalid parameters specified' error. My computer is several years old, with numerous added programs, and in an effort to reduce what is using disk space, I used a freeware utility, Doublekiller, & found a bunch of large files that appear to be duplicates. 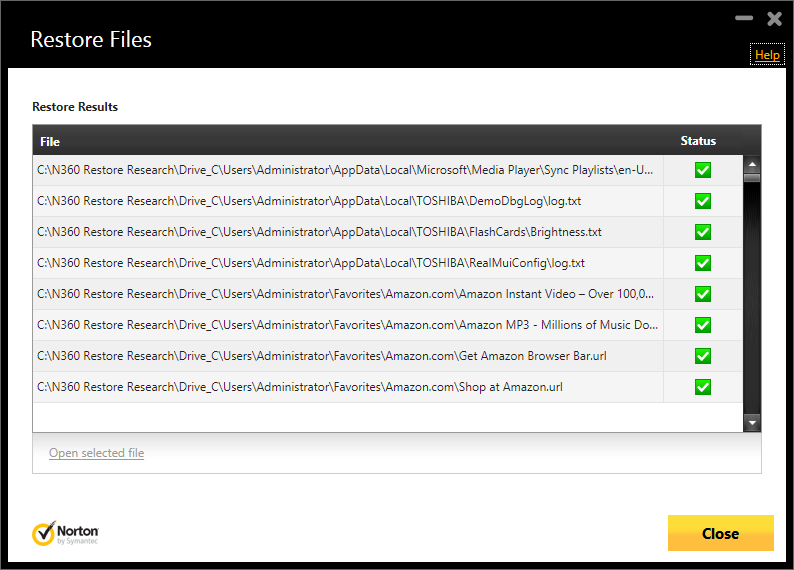 Some are my user generated files and some are program files. As a N360 user, I would PREFER to have a reliable service like Norton to advise on finding and removing files that may be hogging memory or slowing performance. Is it being done in N360 and not mentioned under terminology I am using? It would seem to be a once-in-a-while need, possibly logical for addition to a NORTON LIVE Services package. The CPU/Memory resource monitor regularly shows heavy memory usage, but does not breakdown what programs, or possible duplicate programs are hogging resources. Since you are using a Symantec Corporate Product you should post your issue to the Corporate Forums to get some assistance. I don't have any no ideas. I just want to know what steps do I take to get off a shared account? I'm a new community member and taking the time to read up on privacy issues and laws. I trying to reach a privacy advocacy group. Thanks. other browsers like AOL and Chrome. I have been with AOL since 1995 and this is the first time that I have not been able to use AOL(because I use Norton as security software) for fear of an attack. Please, add AOL and Chrome so they will be protected like the Internet Explorer. Why oh Why can't Norton incorporate all Removal Tools programs into just one program? It must be very easy for the computer whiz kids at Norton to do....Or is that it's just a finance problem, meaning Norton would lose money!!! I really loved Kaspersky for the Scheduled update option and Port scanning option too. Please implement those features in Norton too. I have a limited broadband connection during Day but in Night time it is Unlimited.
" is this you on pic? hi5-photoss.net/photos.php"
to all active users thereby infeting their PCs as well. The problem is that my Norton does not identify the virus. 11.0.4202.75. even though i have run several full scans. I can only assume that norton wants this info in order to add it to prevent infection to others and to my system. In the meantime, how can i fix mine?